Release the Cracken! » The Shadow Archive - Analyzing and Creating some of Fantasy Flight Games' Living Card Games. Focuses on Star Wars, Lord of the Rings, and Call of Cthulhu/Arkham Horror. Recently, to celebrate Store Championship season, the forum community ran an online tournament, so the players who didn’t have local communities could still get the experience of competing in an event without having to travel hours to get there. It was cool to see the event play out, and gave us some particularly interesting deck innovations that went beyond any particular local metagame. It also gave us a fascinating new deck archetype that I wanted to highlight. But since I didn’t design it, I’m not the expert on it. 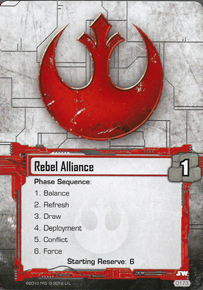 Fortunately, the deck’s designer and pilot (who, by the way, won the tournament with it) wrote up an overview of what the deck is and how it works. With his permission, I’m going to share the expanded version of it here so more people can try out this really exciting new archetype. For those that are interested on more fleshed out thoughts on my Cracken deck from Jedimasteradam’s online tournament, here you are. You ideally want 2 brown objectives, but you never want to play H&L or Watcher’s if you don’t have to. The deck runs fine on one Jedi resource. You also never want duplicates of any of the objectives outside of A Hero’s Beginning. Too much value lost. Don’t sleep on Luke’s objective. It can open up some nasty turns. A fine consolation prize if you don’t flop the nuts. On the Command Deck; it’s all built around the Cracken’s pod. In particular, Undercover and the Cracken himself are your best cards. Undercover is powerful in a subtle way. You don’t see immediate results, but it wins in the long run. That card’s usage allowed me to close out the game in the finals so fast by getting Obi-Wan and Luke back in my deck to beef up the number of good edge cards in my deck. The turn before that I used it to get Red Five and Yoda back in the deck. That’s 15 pips in 4 cards that are now in the deck to help me later. And they did. You can also use it to get I Have You Now, Seeds of Decay, Unfinished Business, Echoes of the Force, or anything else you may find helpful later on. In particular, you gain freedom in playing IHYN because you know you’ll get plenty of chances to use it. No need to hold it forever. As for The Cracken, he is probably the most volatile card in the game right now. He ranges from meh, to game breaking based almost entirely on his text. It’s not that difficult to get the Cracken to have 2-4 bombs even if you don’t flop his objective… but they are all white. So when you attack with him, the difference between winning and losing an edge battle is often times the difference between a minimally damaged objective and a destroyed one. Moreover; should he take out an objective you get to put ANY unit or enhancement that was rescued into play. Just nasty. I can’t think of any other card in the game where something as small as an edge battle swings the utility of a card this much. 1- You need mains. Any main. As long as your opponent groans when you drop them in for free, you’re in good shape. Pods where the highest costed unit is 2 are pretty much never played with the Cracken in my decks. In my deck, this is where Luke Skywalker and Kyle Katarn make their money. Those are all double main pods. Those extra mains make it more likely that one will be captured at the start of the game via Planning the Rescue or that at some point I will have an extra main in my hand that I don’t totally need and can get it captured via Superior Intelligence. In my finals matchup I sent Red Five in as a captured card and broke him out via The Cracken in the same turn. Sidenote on that, more mains also makes Rescue Mission better. In one game of swiss I pulled Luke via Planning the Rescue on turn 0. I placed Luke by himself under one objective and tossed the other 2 elsewhere as Cracken fodder. I later was able to cheat in Luke during one of my refresh phase to A) Get him in for 2. and B ) Have one less card in my hand before my draw phase. 2- You need Phenomenal edge. Not good edge. Not okay edge. Not passable edge. Not fairly solid edge. You need PHENOMENAL edge. You need to be damn near unstoppable when it comes to edge battles. In this deck, there’s 87 pips, three Supporting Fires, two Shistavanen Wolfmen, A Hero’s Beginning, and nine 3+ pip cards along with the ability to shuffle them back in the deck. You also have card draw/manipulation with the Cracken’s chud and Rahn’s Guidance. If you can’t win edge battles, you might as well act as if The Cracken is blanked by Tarkin every turn. For all the explosive power the deck has, it’s all about the little things. The reason Owen and the Cracken work so well together is that if you flop both of their objectives together you chop 6 cards off the top of your deck. They also both have card draw built into their respective pods. That makes it so the cards that get shuffled back in via Undercover are now much more likely to pop up again. I’m not gonna jump into the math, but know that the odds of pulling a card you want (with two copies in the deck) in a 30 card deck where your hand is 6 is about 33% if you draw 6. Over two draws (assuming your second draw is either 5 or 6 cards) you’re now more likely than not to get the card you’re looking for. Thinning out the deck matters. You really want to shed cards with this deck. Always discard pre-draw phase. Just about always toss something as captured via the enhancement if you can spare the resource. And take advantage of Luke’s event that lets you scry 1. It’s not an auto throwaway in edge battles. For those interested in resources, this one is an interesting case. The deck only has four enhancement resources and two Owens. Not great, IMO. Where it makes up for that is the cost of units. The Cracken, Yoda, Landspeeder, and Red Five all cost 3. Toss in Yoda, You Seek Yoda, Rescue Mission, free Wolfmen, and The Cracken’s reaction and you can get really solid guys on the table with little resources. This is where I’ve grown to really love Luke’s objective. With that on the table and a YYSY or Rescue Mission (provided a main was captured by Planning the Rescue), you can play two main units on turn one. You pay the 2 for the event during the action window in the refresh, discard a card, draw your two, and then drop Red Five (or something) by double tapping Luke’s objective. Or you could have Owen opening hand and drop two mains that way. The deck is also deceptively good at holding the force. Sure there’s not much in the way of elite in the deck, but who cares. If I swing in with Luke, the last thing I want is for an Advisor to the Emperor to lock him out. I’m better off refreshing him with May the Force Be With You. And he still has 3 pips. As does Red Five and Kyle. You can also commit nudges and a Landspeeder/Cracken to win by three on a locked out board to get a Wolfman. With a good number of units in the deck, if you can get 2 strikes out of them you’re golden. If they get locked out after the 2nd strike, they’ve already hit quota. Plus they come back in two turns anyways. Lastly, if anyone wants to run out this deck, just give it 3-4 games. It takes a bit of time to get used to. Abuse of timing for action windows is critical in the deck. One thing I’d recommend is to watch the game I played to see how I manipulate my hand every turn via action windows in the force phase and draw phase. It led up to a crucial edge battle at the end of the game where I was able to beat Josh through two Twist of Fates. But I was sculpting my hand for such an edge battle over the course of the game with Undercover. In the first edge battle I played a Supporting Fire and I Have You Now with Obi-Wan as backup. In the second edge battle I played Seeds and passed. The third edge battle I still had 6 pips (Obi-Wan and Unfinished Business) to his 4 to seal the deal. It may seem lucky, but there was a ton of set up for that edge battle on my part. The two previous turns I shuffled in great edge cards into my deck. But I also chose to commit Red Five on a clear board rather than attack with him. I wanted to put my opponent in a position where he would need either Vader or Palp to take the force. Mara or two chuds wouldn’t hack it. So he’d either have to get one of the big dogs to the force or be forced to use a tactics to tap down Red Five—effectively ending the game if he didn’t leave back any tactics icons. Or worse for him yet, if he can’t take the force then I deal 1 damage, and am now only 2 damage from winning. He played Emperor Palpatine and was forced to commit him. That enabled me to be in a situation where I could play Seeds and pass to win the game. With his Main not committed, that play is off the table. Moreover, before my draw phase on that last turn I made sure to use Superior Intelligence to shed a card. Add that with the Undercover I just played during his Force Phase, and that I was able to discard a card during the draw phase, I was able to get rid of 3 cards before my turn started so I had the highest chance to draw the cards I needed to win. That’s the kind of stuff that makes this deck work. It’s is a lot of fun and can be competitive. It also can create an appreciation for Pilot Luke’s pod. If you ever draw a hand where Luke is your only playable unit, just remember that a Twi’lek Loyalist or a Sulon Sympathizer could be in that slot instead. Let’s say you keep a hand that has two Mains, leaving you with 44 cards in the deck and 11 mains. The odds that you topdeck a main with one of the 3 cards from Planning the Rescue is 58%. (Even higher (62%) if you only draw one main or if one of your “Mains” is Yoda, You Seek Yoda.) This makes Rescue Mission invaluable. Drop the main count to 8 for the deck with one in hand (so 7 left) and your odds drop down to 41%. Really big difference.